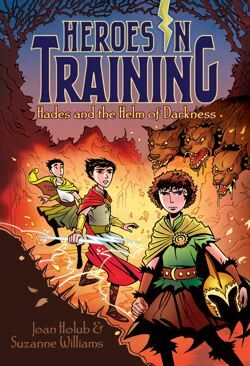 Hades and the Helm of Darkness (Heroes in Training Book 3) The Heroes in Training are entering the Underworld—if Hades can conquer his canine fears, that is. The Underworld usually isn’t really meant to be a fun place—but tell that to Hades! He loves the dark and the stinky smell of sulfur. However, there is one thing that Hades is not a fan of: dogs. And when Zeus and his fellow Olympians encounter Cerberus—a snarling, three-headed dog—Hades must conquer his fears and tame the hound so everyone can continue into the Underworld and deposit their Titan prisoner, Oceanus, back where he belongs! But with magical water that causes forgetfulness, hot beds of lava, and another epic battle with two more Titans standing in their way, will Zeus and his heroes make it out of the Underworld with everyone intact? 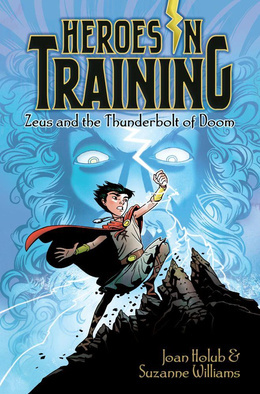 Zeus and the Thunderbolt of Doom (Book 1) After pulling a magical thunderbolt from a stone, ten-year-old Zeus goes on the adventure of a lifetime in this thrilling start to a brand-new series! The terrible Titans--merciless giants who enjoy snacking on humans--have dominated the earth and put the world into chaos. But their rule is about to be put to the test as a group of young Olympians discover their powers and prepare to righteously rule the universe.... Ten-year-old Zeus is mystified (and super-annoyed) by the fact that he keeps getting hit by lightening. Every. Single. Year. He also longs for adventure, as he has never been far from the cave where he grew up. Zeus gets his wish--and a lot more than he bargained for--when he is kidnapped by dangerous, giant Titans! In self-defense, he grabs the first thing he sees--an actual thunderbolt he pulls from a stone that is covered in mysterious markings. Zeus is the only one who can decipher the markings, and sets off on a quest to rescue his youthful fellow Olympians from the evil Cronus. Armed with his trusty thunderbolt (named Bolt, of course), Zeus is on an adventure of a lifetime--and a journey to fulfill his destiny as King of the Gods. Poseidon and the Sea of Fury (Book 2) A young Poseidon must triumph over aquatic terrors in this Heroes in Training adventure. 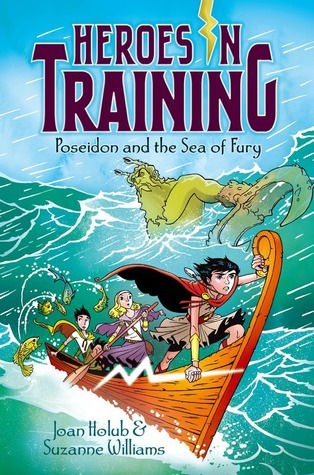 The merciless Cronus and his Titan buddies are in hot pursuit of Zeus, Hera, and Poseidon, who plan to travel across the treacherous boiling sea in order to save a fellow Olympian. They have a boat, but they also have a problem: Poseidon can’t swim and is terrified of the water (well, really of the creatures that lurk in its depths). The group faces danger after danger as they battle singing sirens, a fishy and ferocious Titan named Oceanus, and people-eating monsters sent by Cronus himself. Can Poseidon overcome his fears and help his fellow heroes escape Cronus and his cronies? Author Suzanne Williams Suzanne Williams is the award-winning author of nearly 40 books for children, from picture books and easy readers to chapter books and middle grade fiction series. A former elementary school librarian, she lives near Seattle. 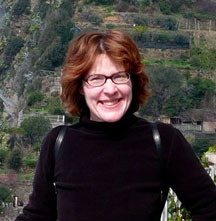 Her picture book Library Lil (illustrated by Steven Kellogg) won the New Mexico children's choice award in 2000 and was on several other state award lists. She is co-author (with Joan Holub) of the popular Goddess Girls series(for ages 8 - 12) and Heroes in Training (ages 6 - 11). Other series include Fairy Blossoms and Princess Power. 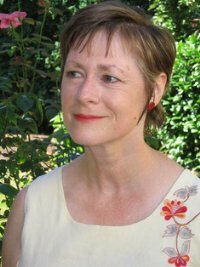 Author Joan Holub I graduated from college in Texas with a fine arts degree, and then freelanced as an art director at a graphic design firm for eight years. I dreamed of working in children's books, so I moved to New York City and became associate art director in Scholastic trade books, where I designed books for children and worked with editors and illustrators. It was a great job. I illustrated my first published children's book in 1992 and soon began illustrating full time. I began completing manuscripts and mailing them out to publishers in the early 1990s. In 1996, I sold my first two manuscripts -- Boo Who? A Spooky Lift-the-Flap Book (Scholastic) and Pen Pals (Grosset & Dunlap). Yippee! Now I write full time and have written and/or illustrated over 130 children's books. Creating books that entertain, inform, and interest children (and me) is a fabulous job that I truly love.